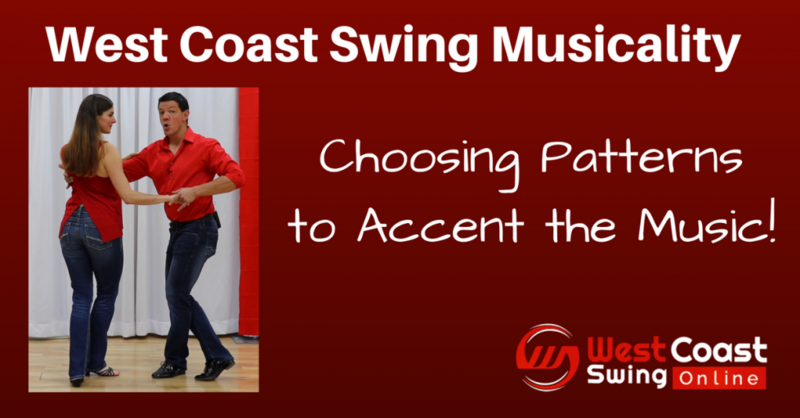 In West Coast Swing, the leader has the primary responsibility for selecting the patterns, that will hit accents in the music. It’s tricky stuff but we are going to try to help you here! Because west coast patterns are typically six or eight counts, and the music we dance to is written in eight-beat phrases, WCS is an “off-phrase” dance. Unlike a waltz, WCS patterns don’t always start on the downbeat of the music. While this makes WCS seem confusing, it also creates the opportunity for dancers to be very musical and create awesome moments within the dance. The drill below is written primarily from the perspective of the leader. However, the follower needs to understand this process as well, so that she can add her own styling and sell the accents the leader patterns to compliment the accents within the music. Musicality is about teamwork, and understanding what your partner is doing is an important element of the partnership. It’s the #1 Key to WCS musicality. Leaders, we’re going to create a simple dance that puts the natural accents of patterns onto the accents of a typical musical phrase. For this exercise, you can use any song that is perfectly phrased in 32 beats. On the 1 of the musical paragraph, start by doing a left side pass. The left side pass will finish on beat 6, so the music is going to go 7, 8, 1, and on the one there will be a new set of 8. We want to hit that accent, so we need a pattern that has a natural accent three beats in. For now, let’s pick a sugar tuck. If we keep counting the music, the sugar tuck will finish on beat 4 of the second set of 8. There will be another musical one in five beats (5, 6, 7, 8, and 1 is the accent), so we need a pattern that has a natural accent on count 5. We can use a whip and emphasize the sendout on 5, so let’s do that. The whip will finish on beat 4 of the third set of 8. We’ll have another accent in another 5 beats, so we need another pattern that has an accent on count 5. Let’s do a left side inside roll. Because the spin happens on counts 3&4, count 5 can either be quiet (the energy has dissipated from the spin), or it can be loud (we’re pushing the energy from the spin into that next step and then settling). In this case, we want count 5 to be loud, so we’ll choose the second option. Our inside roll finishes on the music’s beat 2 of the fourth set of eight, so we have six more counts left before the next musical paragraph. This time, we’ll have the leader spin. Do a left side pass, and instead of a normal anchor, the leader is going to spin to the left. If you are really new to spinning, just do a half turn: connect with your right hand to the follower’s right (handshake) as you face down line, and then you will step forward on 1 (which is away from your follower) in a slingshot position. If you are more comfortable, you can do 1½ spins, either as a triple or on one leg. In any event, you should finish with a right-to-right handhold and be facing down the slot. At this point, the music has come to a new major phrase, and you can repeat the sequence you had above. Since you finished in a slingshot position, just convert the first left side pass into a slingshot side pass and do a hand change to end up back in a left-to-right handhold. Musically, here’s how your patterns fit the phrasing. Each line is a musical set of eight. The bold numbers are where the new patterns begin. For instance, the sugar tuck begins on beat 7 of the first eight, and you can see that you will step walk walk (7, 8), triple step (1&2), triple step (3&4). The musical 1s are all italicized to show where your accents within the patterns fall in the music. The real purpose of this drill is not to have a sequence of steps that you dance every time you hear a 32-beat song. The goal is to start thinking about where the accents are within your patterns and to line those up with where you are in the musical phrase. For instance, you could replace the sugar tuck with any six-count pattern that has an accent on the 3—any tuck, a side pass with the follower starting a spin on 3, an accelerated throwout with a freeze on 3, etc. As you become more comfortable with what your options are, you’ll be able to choreograph to the accents on the fly. But wait there is more….Lots more! There are SO MANY things that can go into mastering musicality in WCS.